I don’t fully understand this picture, either, and I’m the one who cobbled it together. As someone with a libertarian philosophy of government, I’m often found raining on other people’s publicly-funded parades: sports arenas, the arts, environmental programs, saving that old lady down the street from herself and all those cats, parades (literally). But rest assured that this is not some feat only capable by a complete misanthrope who is without anything so cherished as to warm his heart to its existence and continued well-being. I like…LOVE…many damn fine things. I just don’t think anyone else should be forced to subsidize my belief system, my passions, however shared by however many others. 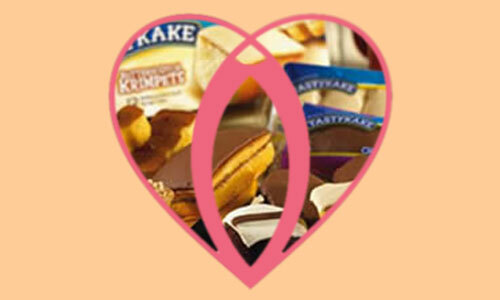 Case in point: TastyKake, Tasty Baking Company. I love ALL of their products. In fact, even though they do not have any consistent presence in New York City, meaning that I have not regularly consumed them for the last 5 or 7 years – a horrible tragedy itself – I still gobbled enough of them in all the years prior that my body is even now still 73% composed of their spongy goddamn goodness. BUT OH NO! Here comes word that Tasty Baking Company is facing some serious financial issues. And if something doesn’t change, Philadelphia may find itself without one of its regional favorites, losing jobs in the process. Despite already sinking taxpayer money to help finance a new factory, Pennsylvania Governor Ed Rendell, is ready with another $1 million in low-interest government loans. I love…LOVE…Tastykake, but there is no way in hell they should be getting any government money. Get the hell out of the way and let things succeed or fail. Perhaps they’ll go out of business completely and the only tastykakes available until the end of time will be old moldy boxes in and out of auction forever, merely collector items gathering dust and value. And you know what? Even given the worst case scenario for these most precious treats, I will somehow muster the strength to go on because I’ve long ago taken to wearing a helmet for both the small and large inconveniences of life. From an optimistic perspective, the company may even be sold and reorganized under better management without any government incentives. Tastykake products are so damn good, that were a competent CEO to run the company it should be very simple with minimal effort to have the company rise to such heights as to surpass the wealth and prominence of Microsoft, Apple, and Google; the nation’s fervor for Butterscotch Krimpets and Peanut Butter Kandy Kakes so great that computer sales plummet in favor of confectionery binging, proving computers were only a fad, after all – a claim my father has been making for years.